Pick up Laminate Flooring for Your Dream Home! This “article” resulted from questions readers had specifically about Pergo laminate flooring. These questions were found in the comments section of various laminate floor articles, but hard to find woven in among the myriad other questions and comments. Pulling the question out of the comments section and making an article of them allows you to have easy access to that information. Maybe your questions will be answered more easily. Therefore, keep posting your questions in the comments section and we will get back to you as soon as we can. This “article” is the result of conversations between readers, like yourself, and The Flooring Lady because of questions they had. Since I don’t “do” comments anymore I wanted you to have easier access to the wealth of information derived from the three-plus years of comments from my readers. You may find your situation reflected in the questions and answers about how clean and maintain your laminate floors. If you are planning to get laminate flooring then it will not be difficult any more. Moreover you have come across the right article which will certainly guide you about all that you need to know about laminate flooring installation. 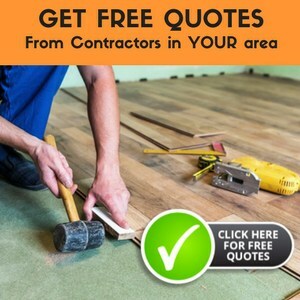 Laminate flooring installation isn’t particularly difficult, in most situations, but we cannot deny the fact that an experienced DIY person will get the job done faster than an inexperienced person. Measuring twice and cutting once is the right technique for anyone planning to install flooring, and that holds with laminate flooring as well. Laminate flooring comes in a variety of types and styles. This wide variety, when combined with the simple laminate flooring installation, has made it one of the most popular types of flooring today. From looks of stone to hardwood laminates, you can find the right laminate flooring for your particular use and needs. You simply need to know your need and style. Yes it is that simple and you can get it done yourself. If you want to know the best way to lay laminate flooring in a bathroom your as best advised to follow the flooring manufacturer’s instructions. Installing bathroom flooring is straightforward, only complicated by the number of items that need to be cut around. Be sure to buy laminate flooring that carries a warranty on bathroom installation. Kitchen laminate flooring is wonderful because of its easy care, good looks, and simple installation. Some suggest laminate flooring isn’t good in the kitchen (or bath either) because of the potential for water damage, but with simple care that’s not an issue. Laminate kitchen flooring will let you complete your kitchen make over with ease. Kitchen flooring laminate comes in a wide range of colors and styles, including: wide plank oak, bamboo, cork, stone, and even brick or tile. Its versatility, beauty and durability shouldn’t have you question kitchen laminate flooring for your house. As a verb it means to bond together in layers, while as a noun, it refers to a material that is produced by bonding together layers of material. For flooring, “laminate” is a family of products in which a finish material is fused to a substrate. Laminates can resemble many things, including wood, stone (like marble, slate, or flagstone), tile, or a solid surface of color (though that’s usually saved for countertops).